Often when you think about starting a side hustle, one of the things that put you off is you don’t want to spend money to make money. Printing business cards, buying things to resell, renting even a desk at a shared office represent some upfront costs for which you don’t want to risk you hard earned money. Well thank goodness for the internet. Now anyone can start a side hustle from home and reach thousands of potential customers in just a few clicks. With platforms like Fiverr, you can leverage the quantity of gigs you get, even if the payout per basic gig is pretty low at $5, you can also add extras or charge for express work. Here are a few ideas of side hustles you can start without putting any money down. If you enjoy writing, making money with your hobby should be pretty easy. Sure, it doesn’t pay much, but if you find a niche you are comfortable with (science, money, travel, mommy, pets…) and are able to pump out decent content pretty fast, there is money to be made. I used to write short 300 word travel articles for a few different websites, and since it was just about places I had been to, it was basically like telling a friend about your holidays. I was able to write at least a couple hundred posts every month. Yes, you read that right. Eventually, after over 5,000 posts I have to admit I was burned out, but instead of having to find a few clients with a big enough budget to buy one well researched post here and there, I was able to have a steady income every month from the same people on a lower budget. You only need a sharp eye and a strong grasp of the language. Proofreading is easy if you are a keen reader, and just like writing, the more you do it, the more work you will be able to finish in a short amount of time. 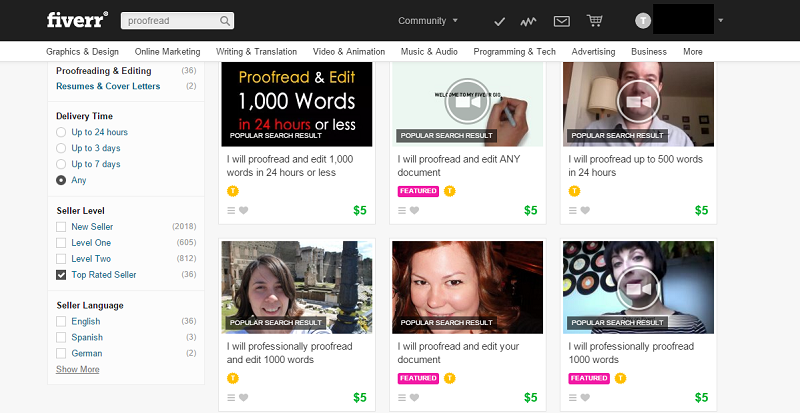 On Fiverr, the typical proofreading gig is between 500 and 1,500 words. Again if you are comfortable with the subject, it should be easy to proofread 500 words in 20 minutes or so, making it a decent $15/hour. You already have the language skills, and there are a lot of companies that aren’t that picky when it comes to having a perfect translation. Sometimes they just want to understand what a document is about, sometimes they need their software or website translated in order to conquer a new market. If you have a doubt about a word or a sentence, there are online translators to help you, unless you plan on translating sensitive documents like legally binding contracts, those are free and should do the job. I never considered that before seeing those gigs on Fiverr. People offer jingles, video reviews of a product, and much more. Once more, you just need yourself and a computer to get started. You’ll need to know your way around voice and video editing, otherwise it may not be a lot of money for the time you’ll spend giving shape to your order, but if you have a template it should save you some time. Say you offer happy birthday videos. You already have the background music and nice “happy birthday!” pictures, you just need the client to provide a few pictures of the birthday boy that you will insert, and you are set. If you already have a blog or an engaged social media page, you can offer advertisers in your niche some exposure on your online outlets. Post an article about them on your website, or do a number of Facebook posts or tweets to your audience. Another easy way to make a few bucks in just a few clicks. I have a friend who worked as a voice-over translator and she got a nice salary! That is such a demanding job. I wanted to do it since I speak French and Spanish but you really need a good training to be up to speed all the time. I am sure the good salary was well deserved. I love writing, since I was in college, I worked as a part time writer. And now, I’m making good money as a freelance writer. I totally agree with you Pauline that it’s good to have a side hustle from home and reach thousands of potential customers in just a few clicks. Thanks for this great list! Thanks Jessica, it is pretty amazing what you can do with a computer those days. Thanks Pauline, I’m going to look into proofreading. There really is no reason for anyone to not have work if they want it – the internet is a wonderful thing! Emma | Money Can Buy Me Happiness recently posted..How Much Does It Cost to Live in Spain? I am amazed at how you can now work from anywhere with an internet connection. And you are right, if you look for work, you should get some. I do document and book formatting. It is pretty quick when you know your stuff but can take hours if you are a newbie. So people are happy to pay for such a service. I would totally pay for that. Formatting a simple blog post makes me want to pull my hair out sometimes! I applied for a few mystery shopping gigs but never was selected. My dream one is to test hotels and restaurants! Last summer I proofread 2 huge English learning textbooks. It was a double win for me since I had to translate AND proofread the whole thing, which meant more $$ for me. Yay! That’s awesome. I did that with travel writing, I wrote for a Spanish site then they launched the French site and asked me to translate all my work. What about SEO, If you are good at it, SEO one of the key Gig’s on Fiverr. There are some fake SEO gig’s on Fiverr, But I provide a good service. SEO is a great way to make money, if you know your stuff like you said. Doing it for the first time takes hours, you can do it in minutes once you get the hang of it. Sites like Fiverr are a rip off and offer spec work. It makes me fume when people push working like a draft animal as a “good idea”. This is not a side hustle at all you just spend a lot of your time making someone else a lot of money while working for peanuts. Many spec work sites do not have any protection for people doing work and you could end up not getting paid at all. No thanks. I loved the blog and post.